Shirley Chisholm: "I Am, Was, And Always Will Be A Catalyst For Change"
On this date in 1924, Shirley Chisholm, the first African-American woman elected to the United States Congress, was born in Brooklyn, New York. Chisholm, who had gone to college to be a teacher, was elected to Congress in 1968, and broke another barrier by becoming the first African-American major-party candidate to run for the Presidency in 1972. 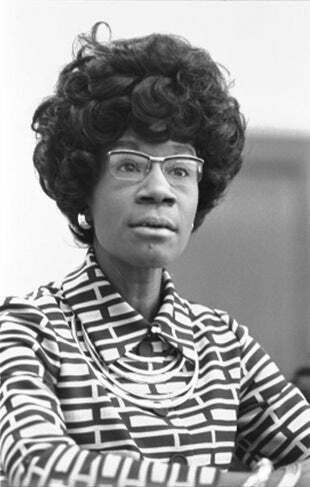 While her run was ultimately unsuccessful, Chisholm earned 28 delegates and ensured that the face of American Presidential politics would be forever changed. "I am a candidate for the Presidency of the United States," Chisholm noted, "I make that statement proudly, in the full knowledge that, as a black person and as a female person, I do not have a chance of actually gaining that office in this election year. I make that statement seriously, knowing that my candidacy itself can change the face and future of American politics—that it will be important to the needs and hopes of every one of you—even though, in the conventional sense, I will not win." Throughout her political career, Chisholm fought tirelessly for civil rights and equal rights for women, and held strong pro-choice and antiwar convictions. After her time in Congress ended in 1982, Chisholm went on to found the National Political Congress for Black Women and spent her days as a professor of politics and women's studies at both Mount Holyoke and Spelman College. Her endless dedication to the promotion of equality earned her a spot in a National Women's Hall of Fame in 1993. Ms. Chisholm died in 2005, but her work lives on, and she remains an inspiration to us all. As Gloria Steinem notes, "Perhaps the best indicator of her campaign's impact is the effect it had on individual lives. All over the country, there are people who will never be quite the same: farm women in Michigan who were inspired to work in a political campaign for the first time; Black Panthers in California who registered to vote, and encouraged other members of the black community to vote, too; children changed by the sight of a black woman saying, "I want to be President"; radical feminists who found this campaign, like that of Linda Jenness in the Socialist Workers' Party, a possible way of changing the patriarchal system; and student or professional or "blue-collar" men who were simply impressed with a political figure who told the truth as she say it, no matter what the cost." But beyond politics, Chisholm herself once spoke about how she'd like to be remembered: "I want history to remember me not just as the first black woman to be elected to Congress, not as the first black woman to have made a bid for the presidency of the United States, but as a black woman who lived in the 20th century and dared to be herself." A clip from the Shirley Chisholm documentary, Unbought and Unbossed, below. Note how Walter Cronkite handles Chisholm's entrance into the race: a symbol of the type of barrier that Chisholm worked so hard to break down.